The internet just got a little more colorful. Why? 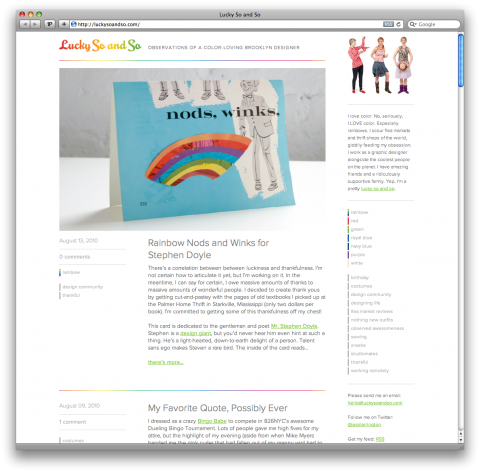 My lovely studiomate Jessi Arrington of Workshop just launched her brandnew shiny blog. Yay! Remember Rainbow Birthday? Well, that was Jessi. I am not surprised that she sports a rainbow and color categories on her site. Make sure to have a looksie at her about page. Jessi makes me smile on a daily basis here at the studio and I am glad I can get my digital fix now, when she’s not around. The world needs more Jessis. Beautifully designed blog. Very impressive (and colourful). Thanks for posting this, Tina! You are my inspiration. I hope I can bring one-onehundreth of the joy you bring to people via your site.